The Corry & Stewart Group was established by Mr Noel Stewart and Mr Aidan Corry on the 1st of November 1998 and was based at 43 Market Street in Omagh. This successful partnership ended mutually on the 1st January 2000 and Mr Corry went on to pursue a successful business in Financial Services & Retail. Noel Stewart retained the Corry & Stewart brand and built an excellent reputation for Personal Service, Presentation and above all Professionalism and Honesty. The business continued to grow and more people were needed to continue giving the best possible service. Opposed to looking for experienced estate agent stereotypes, Noel employed Local People who knew the Area and the Local Properties and possessed Excellent Customer Service skills. Each employee had undergone the buying, selling or renting of their homes in recent years and therefore able to empathise with their clients and prospective buyers. Due to the increased market share, Corry & Stewart expanded further and bigger premises became available on one of the most well known roads in Omagh, the Dublin Road. The business relocated on the 1st July 2003 which has proven to be an excellent location, situated close to one Omagh town centre and one of the town's busiest junctions. In July 2012 Corry and Stewart teamed up with William Sayers of Mortgage & Property Plus estate agents in Omagh, to work closer together and to promote our clients properties to a wider audience locally between both offices, with the aim of providing a better service for the local property market and to date this has proved a mutually beneficial move. 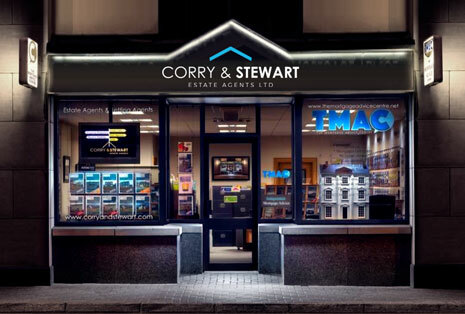 Corry & Stewart are now widely recognised as a Dynamic Residential and Commercial Sales Specialist in the Omagh area and we are proud to be acclaimed as one of Tyrone's most Popular and Used Estate Agents within all sectors of the property market. The company's attention to Individual Client Requirements is paramount to it's success. Our office ensures that a 1st class service is provided to all who deal with us whether through a general enquiry a sale or a purchase. If you are Buying, Selling or Renting a property in Omagh or the surrounding areas, please call in or phone our offices where our staff will make you feel most welcome. We hope that by combining traditional, personal service with modern facilities and equipment you will find us a refreshing change.